Ok, I'm stretching the truth and there's a back story. Someone said that if we get hit by a hurricane I'm going to be a wreck without coffee. I'm not "quite" that badly addicted to it. I drink Half Caff anyway, and the picture below has one of those 16 ounce mugs that I have two of. Works out to two regular coffee cups worth of caffeine so I'm managing that. First off toss your percolator or your Mr Coffee. One recirculates everything to make it bitter, the other introduces flavors through a filter. The way I do it is seriously old-school. Like Byzantine. I basically use the "Turkish Method". The coffee is absolutely fresh, in fact that popcorn popper was roasting some regular coffee beans while I was making the first mug of the day. While I have to use electric to roast the coffee, I can cheat here and say that since I have a battery inverter, I can do it in the car. Kevin's car even has a 120VAC outlet in the back that we used to make mashed potatoes in once in a power cut. So I get fresh beans. Now how to actually make the coffee. Boil at least 2 cups of water. Starbucks makes lousy over roasted coffee, but they're right about one thing - if the coffee sits more than 20 minutes, it's gone off. Pass it off to a less discerning character since the flavor faded. Same thing about the beans that you bought in your local supermarket. If the beans are more than 3 weeks old, the flavor has begun to change. Vacuum packing only slows the inevitable. While you're waiting on the water to fully boil, put four scoops of espresso ground coffee grounds into the pot. Yes, Four. I use two regular and two decaf. I also add three packets of Sweet N Low and one tablespoon of coffee creamer to the empty coffee mug. Pour exactly 2 measured cups of boiling water into the measuring cup. I use a plastic cup because it's handy and I have some non-scientific belief that it adjusts the temperature of the water down to the 190F that is supposed to be the holy freaking nirvana of coffee brewing. Immediately pour the water into the grounds. Set your timer to 4:30 Seconds. Exactly. Begin to stir. Your coffee grounds should bubble to the top. Stirring will break the oxygen bubbles off of the grounds so they will sink. You do not need to stir constantly. I typically stir it enough to get the stuff spinning, and do so three times over the next two and a half minutes. Allow the coffee to rest for the last two minutes. By now all of the grounds will have sunk to the bottom. If not, you either just pulled the beans out of the roaster or they're seriously old and dried out. Like more than three weeks old. Spoiled Coffee is lighter. Freshly roasted will not have evaporated all of the CO2 so it will be lighter. If you let the beans sit for a day as ground, on the second day you will have the best taste. On the second day the coffee will have rested, biblically so, and be more dense. Since I only roast about 4 days worth at a shot, it will be in the "sweet spot" always. Now that the timer has sounded, turn it off, and get your permanent filter. 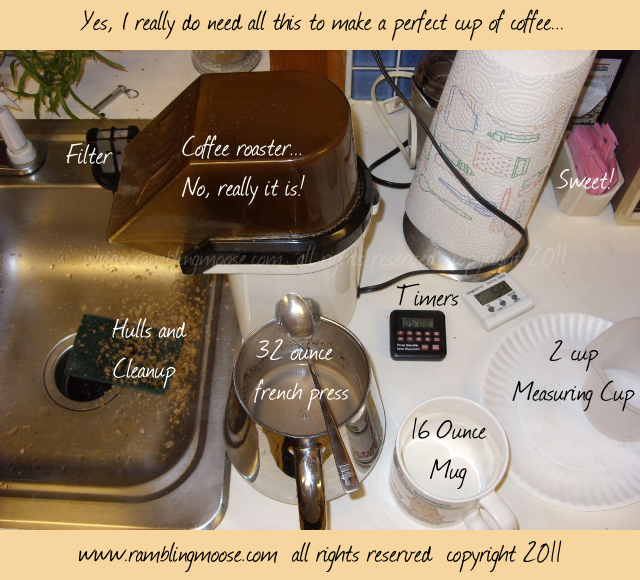 The one I use is from an old one shot coffee maker, but any permanent filter will do since the filter medium is "inert" and flavorless. Hold the filter over the mug and without burning yourself, pour the coffee from the pot into the mug. Now stir the remaining coffee and enjoy after emptying the grounds from the permanent filter and pot into the trash bin or over your garden once they cool. You see you can do this on a camp stove or in a kitchen. I just did earlier and it turned out great. After all, my gas grill out back has a gas burner on it and I can put the tea kettle on the thing for my boiling water!